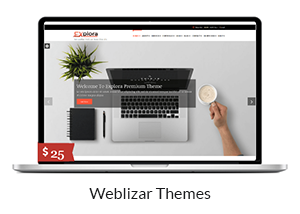 Clock In Pro Plugin is used for on-line worker time tracking, it permits employers to easily clock in clock out with their system. Track the attendance of all registered employees with a clock in or out a system. 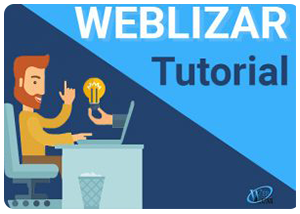 Step 2 – Upload, Install & Activate plugin into a WordPress site. 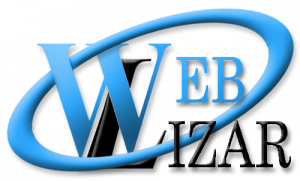 Now the plugin is successfully installed on our site. Our comprehensive system supports businesses by providing associate worker clock, Salary status (Monthly or Hourly), Leave Management Module and Attendance Management Module etc. Managing workers shift is now very easy. 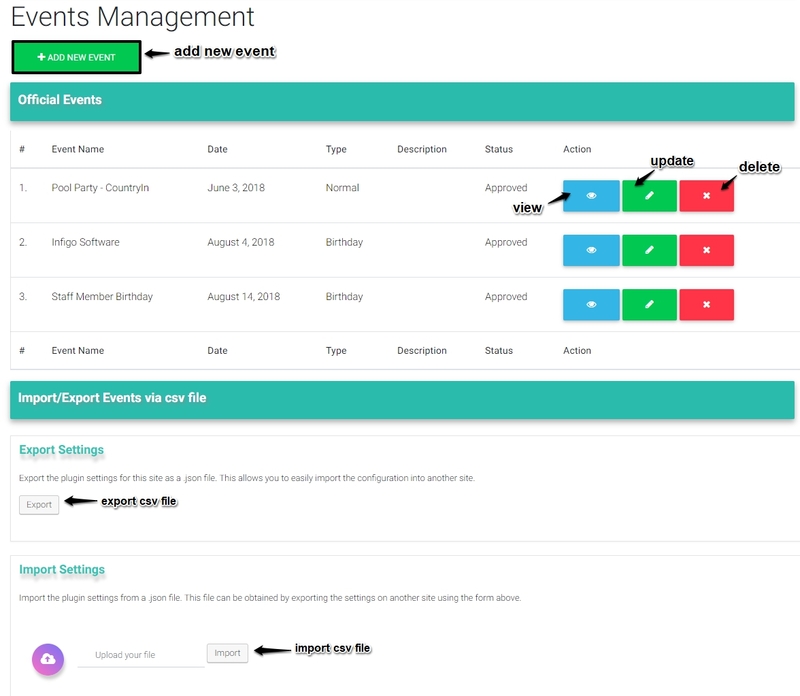 Add workers and manage their work in and out time. Check your worker’s monthly report, you’ll be able to track all workers attendants. 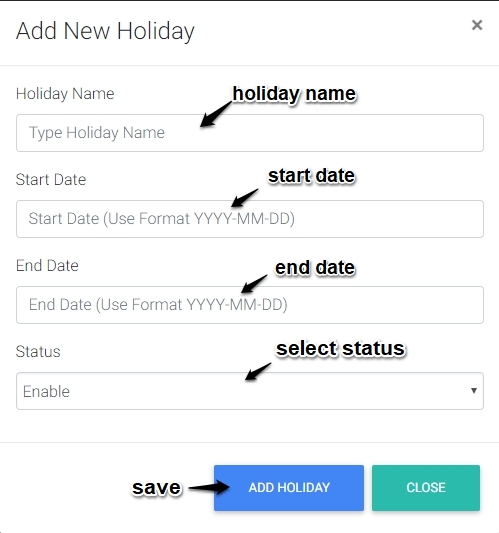 you’ll be able to add business holidays to the system so your workers can see business holidays on their dashboard. 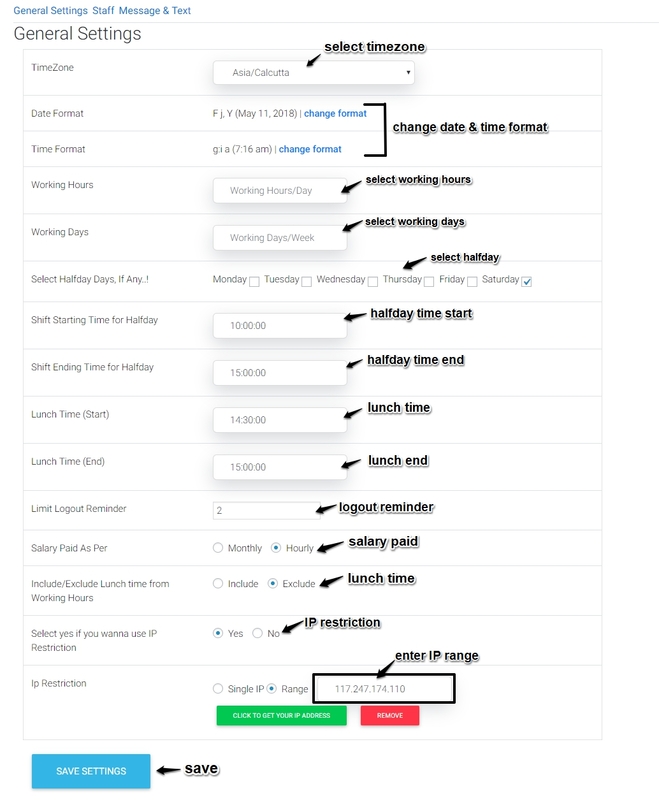 Clock In Pro Features contain Set Your Timezone, check Salary status (Monthly or Hourly), IP Restrictions can be defined for Employees, Shift Management, Holiday Listing, Leave Management, Event Management and Notice Management. Clock In Pro Option display Dashboard of Today’s Status, display the list of employees their name, today’s date, office in, office out, lunch in, lunch out, punctuality, IP address, location, status, and action of each employee. Go to Dashboard -> Clock In Pro -> Clock In Pro option. Report Option display report of an employee. You can filter record using staff member name, month or days(attend days, absent days or all days). You can filter record according to month – previous month, current month, previous 3 months, previous 6 months, previous 9 months, or previous 1 year. Go to Dashboard -> Clock In Pro -> Report option. Staff Management option display list of staff members. 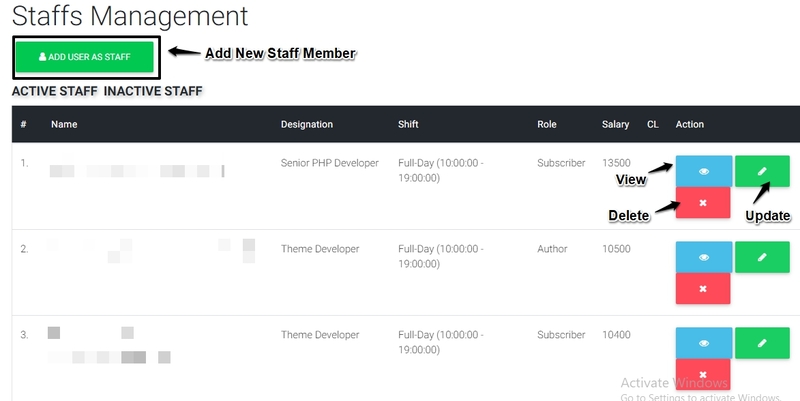 You can view detail of each staff member, update their details or delete the staff member. 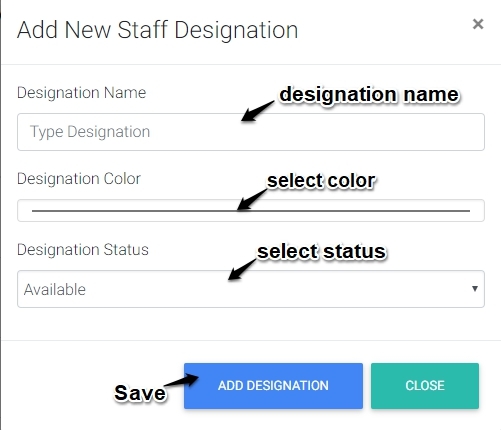 You can also add new staff member – select user, add – Username, First Name, Last Name, Email, Shift, Designation, Salary, Add Leaves and Status. Go to Dashboard -> Clock In Pro -> Staff option. 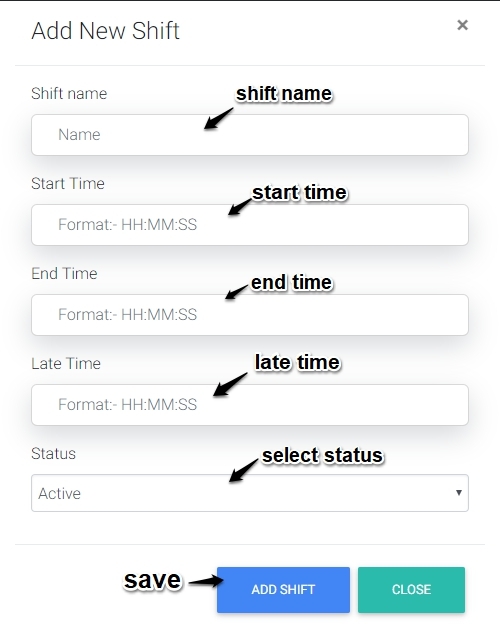 Shift Management panel display name of a shift, start time, end time, late time and total staff in a shift. You can view, edit or delete shift. Also, add a new shift. Go to Dashboard -> Clock In Pro -> Shift option. Designations Management panel contain list of designations. 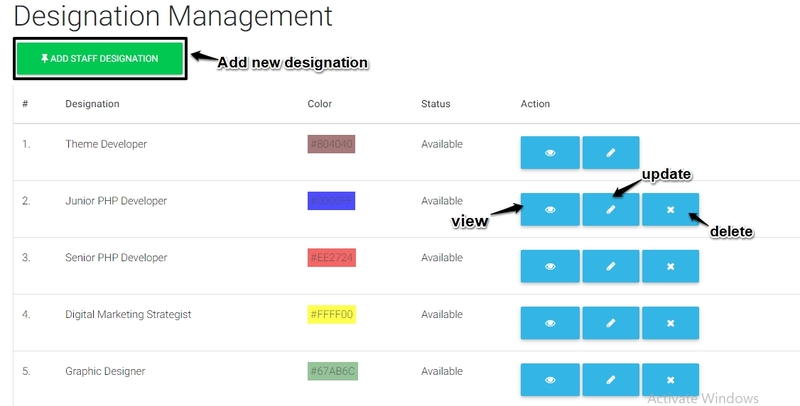 You can view, edit or delete designations. Also, add a new designations. Go to Dashboard -> Clock In Pro -> Designations option. Holidays Management panel contains a list of upcoming holidays. holiday name, date, number of days and status. You can view, edit or delete holidays. Also, add a new holiday. Go to Dashboard -> Clock In Pro -> Holidays option. Leave Request panel display list of leave taken by employees their name, title, description, date, number of days and status. You can filter leave request according to months or pending, approved and canceled leave. You can filter leave request according to month – previous 1 year, previous 9 months, previous 6 months, previous 3 months, previous month, current month, next 3 months, next 6 months, next 9 months or next 1 year. Go to Dashboard -> Clock In Pro -> Leave option. Event Management panel display list of upcoming Official Events in a company. 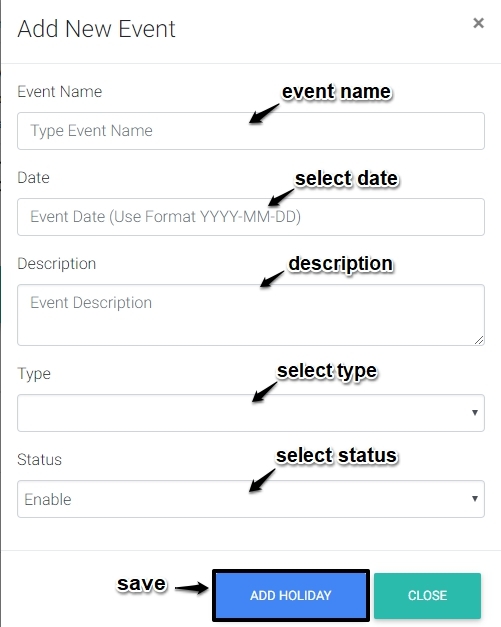 Event record contains – Event Name, Date, Type, Description, and Status. Also, add a new event. Go to Dashboard -> Clock In Pro -> Event option. Notice Management panel display list of notices. 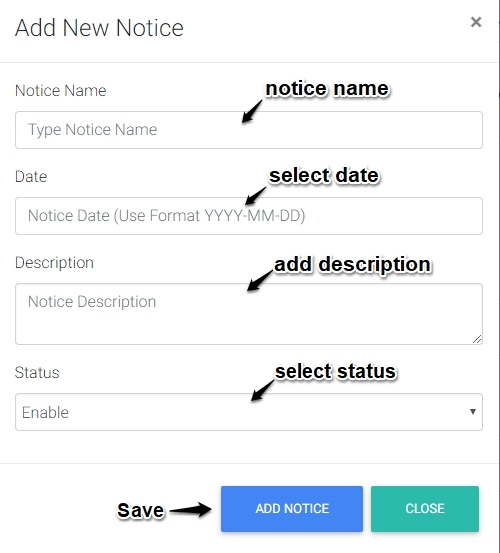 Notice record contains – Notice Name, Date, Description, and Status. Also, add a new notice. Go to Dashboard -> Clock In Pro -> Notice option. Settings options have some general settings regarding plugin, staff settings and message and text settings. Go to Dashboard -> Clock In Pro -> Settings option. For staff – contain show holidays and report submission option. 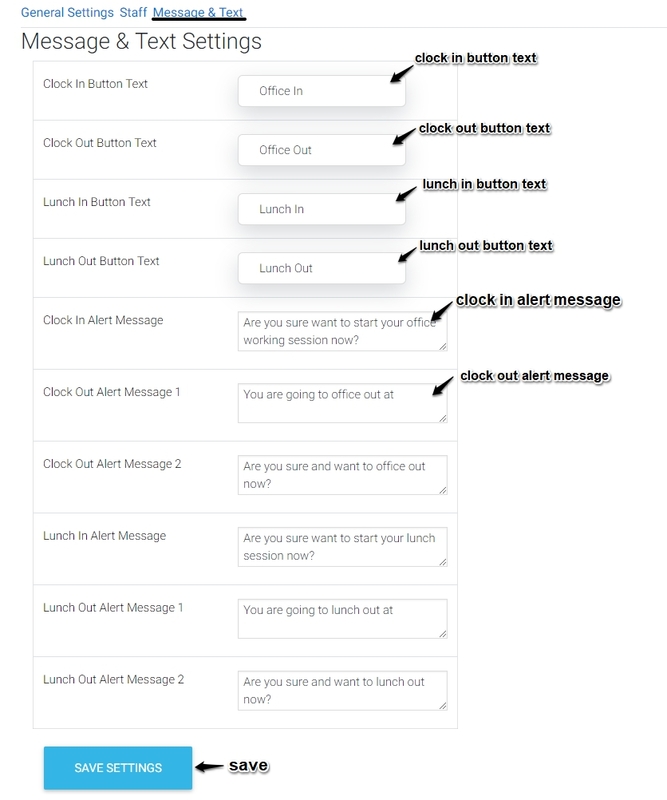 Message and text settings regarding – button text, alert message for a clock in and clock out, alert message for lunch in and lunch out.